What Kathy offers is simple, hard work, extensive knowledge of market conditions and areas, years of experience and genuine concern for her customers and their needs. She believes technology is an integral part of her business, but no substitute for customer service. 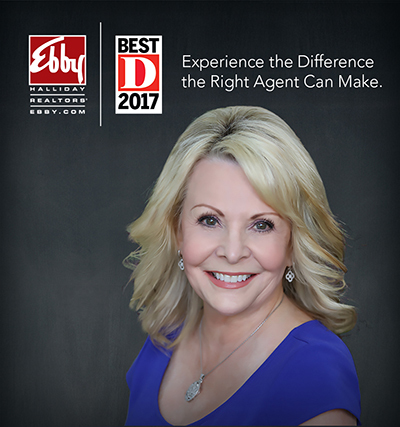 Kathy won the Frisco Ebby Halliday VIP in Service Award in 2015 and 2017, which explains why 80% of her business is personal referral and lifelong clients. Kathy uses her knowledge of the Real Estate Market coupled with an extensive network of industry leaders to expertly guide clients in achieving their goals. Kathy loves what she does, she is a native Texan through and through and her style is down to earth, honest, results driven and laser focused on serving her families. Kathy has numerous industry designations, and has been recognized in D magazine every year from 2011-2018. Kathy is a Relocation Specialist with the Ebby Halliday Relocation team, serving customers from all over the globe. Kathy is consistently a member of Ebby’s companywide honor roll and is a recipient of Ebby’s coveted Eagle Award. successfully marketing and selling their existing home, Kathy provides her customers with on trend ideas, and a competitive edge.